Want to clean your home without chemicals? We've got the perfect cleaning product: lemons. The acid in lemons has both antibacterial and antiseptic properties, and let’s not forget about its wonderfully citrus smell, which is both refreshing and invigorating, while the oils in the rind can also help to clean and shine. Use our guide to cleaning with lemons to get the best results. If you are cleaning your home from top to bottom, you can find more tips and hacks on our hub page. And don't miss all our favourite top 50 cleaning products, chemical-free or otherwise. If you are wondering what to do with leftover lemon peels, here’s a great idea. It will give you a cleaner that is natural, effective and smells lovely. 1. Take a large Mason jar or pickling jar and fill it to at least halfway with leftover lemon peels. 2. Pour white vinegar over the peels until it fills the jar. 3. Close the jar with a lid and then leave it in a dark place for two weeks. The longer you leave it, the more the citrus oil will infuse the vinegar. 4. After two weeks, strain the liquid into a large bowl through a fine mesh sieve. You can now throw away the peels. 5. Pour your citrus cleaner into spray bottles and use it as you would any all-purpose cleaner. Find more ways to use vinegar to clean your home. 1. Combine well a mixture of one part lemon juice and two parts olive oil in a bowl. 2. Dip in a soft, clean cloth before rubbing in a gentle, circular motion over your sideboards and tables. For wooden furniture, go in the same direction as the grain. 3. Use another dry, clean cloth to wipe excess oil off the furniture. You'll already know, if you've read our kitchen cleaning hacks, that lemon is a great go-to for disinfecting and cleaning kitchen surfaces. Below are our favourite ways to clean your kitchen with lemon. Clean your wooden chopping boards by sprinkling the surface of them with coarse salt before rubbing over with half a lemon, cut side down, squeezing gently to release juice as you rub. Let it soak in for 10 minutes before scraping it off and rinsing with a clean, wet sponge. Freshen up a stinky microwave by pouring about half a cup of water into a microwave safe container and squeezing the juice of half a lemon into the water. Place the bowl in the microwave and microwave for three minutes. Find more ways to clean a microwave with our guide. Clean the tiny bits of cheese caught between the nobbly bits of your grater by dipping half a lemon into salt and then scrubbing the grater. Leave for five minutes before running the grater under hot water to remove the remnants of cheese. If food leftovers have stained your plastic storage containers, cut a lemon in half and rub the cut side over the stains on the plastic. Ensure that you are squeezing the juice onto the plastic as you rub. For the best results, let your containers dry in the sun, before rinsing and washing as normal. Make copper saucepans gleam again by sprinkling salt onto half a lemon and rubbing it firmly over the surface of your cookware. The salt acts as a very gentle abrasive, but if you are worried about delicate pans becoming scratched, squeeze the lemon juice into a bowl and mix with some salt to make a less coarse paste. You can also apply the paste to stubborn areas of staining, leaving it on for about 10 minutes before you rinse off the paste and wipe your pan clean. You can do your washing up in a similar way – slice a lemon in half, sprinkle some bicarbonate of soda on the cut side and use it like a dishcloth to wash your dishes. The citric acid will cut through the grease, loosening and dissolving it. Rinse and dry. Find more ways to clean your home with bicarbonate of soda. Descale your kettle by mixing 30ml of lemon juice with 500ml of water and pouting it into your kettle. Leave it to stand for an hour before boiling the kettle. After the kettle has boiled, pour away the liquid, rinse out the kettle thoroughly and boil it again using clean water for one final rinse. Deodorise your dishwasher and make it sparkle by filling a dishwasher safe mug or cup with lemon juice and placing it onto the bottom rack of the dishwasher. Run the rinse cycle and your machine will smell much fresher and it will be cleaner too. Find more ways to clean your dishwasher with our guide. To refresh the refrigerator, simply cut a whole lemon into pieces and place them on a small, shallow plate. Before you put it on a shelf in your fridge, sprinkle the lemon pieces with either salt or bicarbonate of soda because this will help the lemon to absorb odours. To help maintain the zesty lemon scent, try squeezing some lemon juice straight onto your cloth when you give the interior of your fridge a wipe over. Find more ways to clean a fridge with our guide. When you have been working with food that has a strong smell such as onions, garlic or fish, it can be hard to remove the odour from your hands. Take some lemon peel and rub it over your fingers and hands to banish the smell. Alternatively, squeeze some lemon juice into a small bowl of warm water and wash your hands in it. Stainless steel sinks can go from brown and stained to clean and sparkly by sprinkling salt over a damp sink and then rubbing half a lemon over the top. The lemon and salt will work together to remove the discolouration. If your sink is smelling less than fresh, squeeze the juice of three lemons down the plughole and leave for at least an hour without running any water through it. Then carefully pour a kettle of boiling water down the plughole and this should flush out any build up of the grease and grime causing the bad odours. Find more ways to clean stainless steel in our guide. Instead of using harsh chemicals to get rid of ants, try dripping or spraying lemon juice on and around the routes that they use to get into your house, such as floorboards, wall cracks and window sills. Put it around the entrance to your cupboards too. Repeat until the ants have stopped invading your home and rinse the affected areas. Find more ways to get rid of household pests in our guide. Lemon is the perfect cleaning solution for bringing a shine and fresh scent to the bathroom, too. 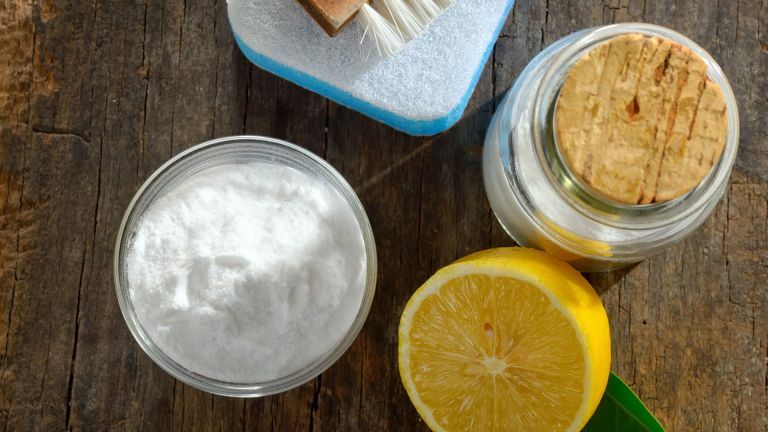 You can find more bathroom cleaning hacks in our guide, but read on for our favourite ways to clean a bathroom with lemon. Rid your shower door of soap scum build-up by rubbing half a lemon directly onto it. You can sprinkle salt onto the cut side before you start cleaning if you wish. Leave for 10 minutes and then rinse well. You can make your windows and mirrors sparkle by mixing two tablespoons of lemon juice with a quarter of a pint of water. Put the mixture into a spray bottle and shake it to blend the water and juice. Spray it onto your windows and mirrors and wipe dry with a lint-free cloth. Find more ways to clean windows for an elbow-grease-free shine. Get your loo sparkling by squeezing the juice of one lemon all around the interior of the bowl. You can sprinkle on some salt or baking soda for extra cleaning power if you want to. Use your toilet brush to give the bowl a gentle scrub. Find more ways to clean a toilet in our guide. Keeping your bathroom taps gleaming requires regular cleaning. Harsh chemicals can damage the surface, so give them a rub over with the cut side of half a lemon (although we'd do a spot test first, just in case your taps' material reacts badly to lemon juice). The lemon juice is perfect for tackling limescale and build-up from water deposits. Rinse them off with a damp cloth when you have finished. Find more ways to clean a bathroom sink in our guide. Get to grips with grubby grout by squeezing the juice of one lemon into a jug, before sieving it into a bowl. Add bicarbonate of soda to form a paste, which should be slightly thinner than toothpaste in consistency so that you can smear it onto the grout. Coat the grout with a thin layer of paste and allow it to set for five minutes so that it can loosen the grime. Gently rub the paste into the grout with a soft toothbrush or cloth and then rinse with clean water. Repeat if necessary. Brighten your whites by washing them first and then soaking them in 5 litres of cold water with the juice of one lemon. Leave them to soak for an hour. Put them on a spin cycle to remove excess water afterwards. See more clever laundry hacks to find out how to lighten your load.